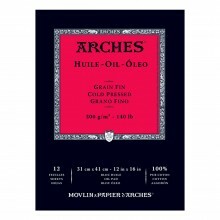 Arches Watercolour, Oil and Printmaking Paper is sold as pads, blocks, single full sheets or in packs of full sheets. All paper is flat packed and guaranteed to arrive in perfect condition. Available in a range of textures and surfaces including three surfaces HP, Not and Rough.